These shows just don't get shown 24-7 like "A Christmas Story." Which ones do you remember? --The Bear Who Slept Through Christmas. (1973) Casey Kasem narration! Tommy Smothers as Ted E. Bear! --The Glo Friends Save Christmas (1985). Remember that Glo-Worm toy? Yeah. Featuring the voices of "All in the Family" stars Carroll O'Connor and Sally Struthers. Watch it online. 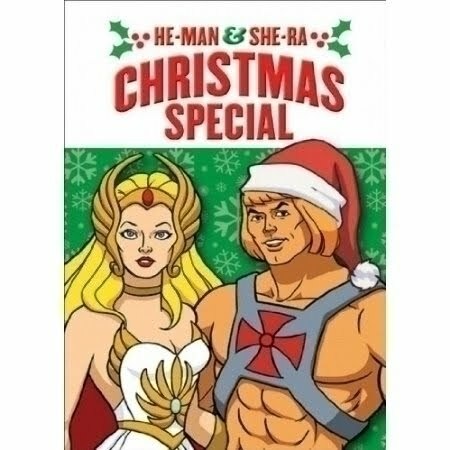 --He-Man and She-Ra: A Christmas Special (1985). Perhaps the best title of the bunch. Awesomeness. Just try to follow the plot summary at Wikipedia. That thing's as complicated as Ulysses. --Nestor, the Long-Eared Christmas Donkey. (1977) Rankin/Bass greatness! Yet somehow not nearly a famous as Rudolph and crew. --Ziggy's Gift. (1982) Look, has Ziggy ever been funny or witty? Yet this thing won a Emmy. Also, the Wikipedia summary was apparently translated from the Bulgarian or something. Actual line: "Ziggy lets the cat know the fealling his mutchle but the cat is need at the poor famlys house more." --Raggedy Ann and Andy in the Great Christmas Caper. (1978) Raggedy Ann must have had a slight comeback in the 1970s. I had and loved the doll and had a couple of the Johnny Gruelle storybooks, too. Wholesome yet somehow mischievious, I loved her. That said, I don't ever remember seeing this special, which includes the encasing of toys in something called "gloopstick." --A Snow White Christmas. (1980) Do not remember this AT ALL. Was it even shown in this country? Snow White and KING Charming have a daughter, also named Snow White, with snow white hair? --The Night The Animals Talked. (1970). Kind of a cult fave. Apparently passed around on bootleg tapes like The Star Wars Holiday Special, only, you know, not as crappy. --The House Without a Christmas Tree. (1970) Aw, I loved these Gail Rock books, in part because they were written by a "Gail" and my name was just not that common. But also, who couldn't love Addie, when her dad blames her for killing her mom and won't let her have a Christmas tree, and then she wins one at school? There were other holiday books (The Thanksgiving Treasure, Addie and the King of Hearts) and all were awesome. Here's another one you never see--"A Wish for Wings that Work". Bloom County's Opus and Bill the Cat help Santa. I remember that it was very sweet, and rather beautiful. This movie made a big impression on me when I was a kid, but I think I only saw it once. Alexa Kenin! it seems like she was in everything in the Seventies.